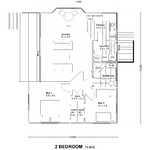 The Big River Homes two bedroom home offers a larger floor area alternative to our many of our market competitors. 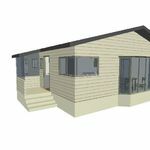 This design has proven popular as a first home which can be extended very easily at a later stage, retirement Home or Holiday Bach. 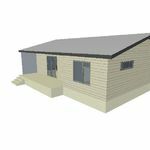 Please note however a 2 bedroom home (75 to 80m2) is similar in price to a 3 bedroom home at 131m2. This is because you still have the expensive items like the Kitchen and Bathroom(s) along with all other building costs. Alot of people assume that making the floor area smaller decreases the cost which it does minimally, however the square metre rate increases. Likewise the larger the home the smaller the square metre costs involved.